Annuals; hirsute (trichomes cylindrical). Stems often several from base, erect to ascending or decumbent, branched distally, (5-)1-2.4(-3.2) dm. Basal leaves not rosulate; petiole (0.5-)1-3 cm; blade 1- or 2-pinnatifid, 0.7-3.5 cm, margins (of lobes) entire or dentate. Cauline leaves usually sessile, rarely shortly petiolate; blade obovate to oblanceolate (in outline), 0.8-2 cm × 2-9 mm, base cuneate, auriculate or not, margins dentate to laciniate or pinnatifid. Racemes elongated in fruit; rachis hirsute, trichomes mostly straight, cylindrical. Fruiting pedicels divaricate to horizontal, usually slightly recurved, rarely straight, (terete), 2-3.5(-5) × 0.2-0.3 mm, puberulent adaxially or, rarely, throughout. Flowers: sepals (tardily deciduous to somewhat persistent), ovate to broadly oblong, 0.7-1 × 0.4-0.6 mm; petals (absent or rudimentary), white, linear-oblanceolate, 0.1-0.7 × 0.05-0.15 mm, claw absent; stamens 2, median; filaments 0.7-1 mm; anthers 0.15-0.2 mm. Fruits orbicular to broadly obovate or elliptic, 2.2-3.5 × 2-3 mm, apically winged, apical notch 0.2-0.3 mm deep; valves thin, smooth, not veined, glabrous or sparsely puberulent (along margin); style to 0.1 mm, included in apical notch. Seeds ovate, 1.2-1.6 × 0.7-1 mm. Flowering Mar-Aug. Prairies, pastures, floodplains, waste grounds, llanos, disturbed areas, roadsides, flats, calcareous sand, alluvial terraces; 0-1200 m; Ariz., Ark., Calif., Kans., La., Miss., Mo., N.Mex., Okla., Tex. ; Mexico (Baja California, Coahuila, Hidalgo, Nuevo León, Puebla, San Luis Potosí, Tamascaltepec, Veracruz); Central America (El Salvador, Guatemala). Hitchcock distinguished var. insulare from var. oblongum on the basis of having fruits smaller (2-2.5 versus 2.5-3 mm) and rotund to obovate (versus elliptic or obovate-elliptic) and fruiting pedicels puberulent (versus glabrous) abaxially. The shape and size of fruits almost never covary, and some of the insular plants (e.g., Trask 28, GH) have the largest fruits; some populations from Arizona, Oklahoma, and Texas have smaller and perfectly orbicular fruits. As for the pubescence of fruiting pedicels, some of the inland plants cited by Hitchcock as L. oblongum (e.g., Brewer 27, GH) have pedicels pubescent abaxially. 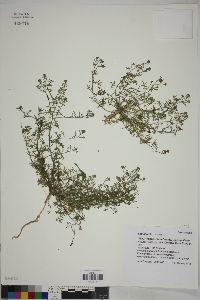 A recent report of Lepidium bonariense naturalized in Skagit County, Washington, was based on misidentified L. oblongum; all the vouchers for it belong to the latter species. Lepidium oblongum often has several stems from base, usually auriculate distalmost leaves, and fruits 2-3 mm wide. By contrast, L. bonariense has single stems from base, non-auriculate distalmost leaves, and fruits 2.7-3.5 mm wide. 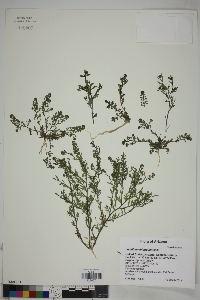 Duration: Annual Nativity: Native Lifeform: Forb/Herb General: Herbaceous or suffrutescent annuals or biennials, 10-24 cm tall, stems erect to ascending, much-branched, hirsute. Leaves: Alternate, not arising from a basal rosette, basal leaves petioled, 1-2 times pinnatifid, 1-3.5 cm long, the margins entire or dentate, cauline leaves sessile or short-petiolate, ovate to oblanceolate in outline, 1-2 cm long and 2-9 mm wide, margins dentate to pinnatifid. Flowers: Very small, sepals ovate to oblong, 1 mm long and 0.5 mm wide, petals absent or rudimentary, white when present, linear oblanceolate, to 1 mm long and less than 1 mm wide, without claws, stamens 2, filaments to 1 mm long, inflorescences borne in dense racemes, these becoming elongate and open in fruit. Fruits: Fruits 2-celled, strongly flattened to a right-angle to the partition, orbicular to broadly obovate or elliptic, 2-3.5 mm long and 2-3 mm wide, apically winged, the apical notch 0.2-0.3 mm deep; valves thin, smooth, not veined, glabrous or sparsely puberu Ecology: Found on calcareous sand and alluvial terraces in prairies, pastures, floodplains, waste grounds, llanos (tropical grasslands), disturbed areas, roadsides, and flats, from 0-4,000 ft (0-1219 m); flowering March-August. Distribution: CA, s AZ, s NM, KS, s NE, TX, LA, AR; south to s MEX. Notes: Distinguished by the dense, many, often decumbent to ascending stems from base with soft, appressed hairs; pinnatifid basal leaves; usually auriculate and pinnately lobed leaves near the top of the plant; small petals, <2 mm long; persistents sepals at the base of the fruit and fruits 2-3 mm wide with the style not surpassing the notch. Ethnobotany: There is no specific use recorded for the species, but tender plants and roots of the genus were eaten as potherbs. 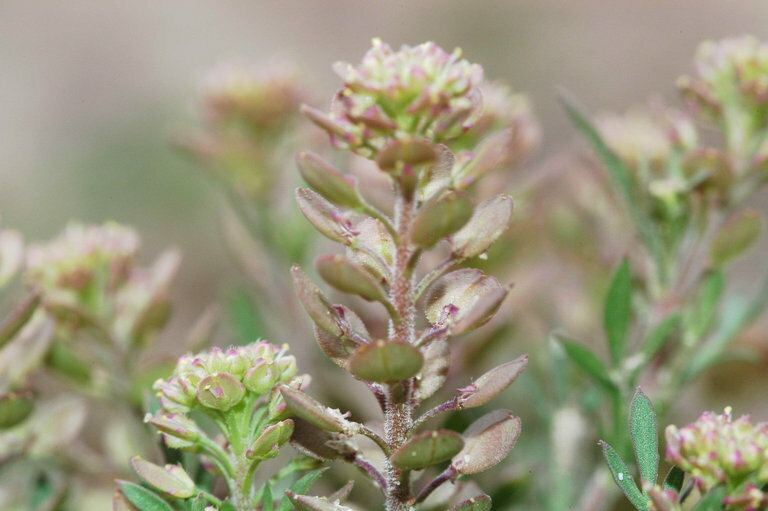 Synonyms: None Editor: LCrumbacher 2011, FSCoburn 2015 Etymology: Lepidium comes from the Greek lepidion, meaning "a little scale," in reference to the shape of the fruit pods, while oblongum means oblong.